Laughing Stock Theater Co. is celebrating 30 years of community theater with a production of Joseph Kessering's classic comedy "Arsenic and Old Lace" at the nexStage Theatre in Ketchum. The play runs from Thursday, May 24, through Sunday, May, 27, and Thursday, May 31, to Sunday, June 3. Show time is at 7 p.m. 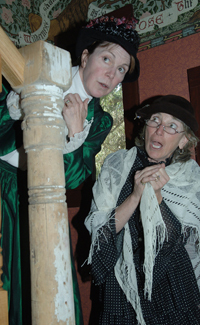 Among the appeals of "Arsenic and Old Lace" are the two charming spinster sisters, played by Kathy Wygle, managing director of nexStage Theatre and founder of the Laughing Stock, and her New York City based sister, Patsy, a working actress and acting coach. As the nexStage Theatre continues its capital campaign goal of $1.5 million to buy the theater, Laughing Stock remains at the forefront of the theater community in the Wood River Valley. "Laughing Stock needs and loves nexStage," Wygle said. "We pick plays that work with one set, such as Neil Simon plays and Agatha Christie's 'Ten Little Indians.' At the nexStage, we have to be very imaginative because everything is exposed to the audience. When doing big musicals, the stage has to be very versatile and sometimes it's tough to divide a three-act play when there is no front curtain. It can be difficult to stage." Over the decades, out of necessity, Laughing Stock has performed in a variety of locations from Whiskey Jacques and art galleries to the Sun Valley Opera House. It has even taken the show on the road to Boise. "We traveled around because the Opera House was not always available," Wygle said. "We couldn't ever be in first position and could only really use it in May and November. It was great and we loved it, but it became a serious movie theater. We never had a home because we are not a resident theater company." Laughing Stock does not have a staff and nobody is paid except for equity actors and technicians. In the summer, the company offers young people a week- long theater experience at Camp Little Laugh, just north of Ketchum. With the production of "Arsenic and Old Lace," Laughing Stock rolls out the laughs with an eye to the future, and the hope for a permanent home. For tickets and information, call 726-4TKS.